"He shows you how to become as gods. Then he laughs and jokes with you, and gets intimate with you; he takes your hand, and gets his fingers between yours, and grasps them, and then you are his." People do not wake up one day and suddenly decide to become monsters, giving birth to unspeakable horrors. And yet throughout history, different peoples have done truly monstrous things. The Americans were pioneers in forced sterilization and state propaganda. The British invented concentration camps, and were masters of predatory colonization. They even turned a large portion of the capital of their Empire into a festering ghetto through the Darwinian economics of neglect. None have clean hands. No one is exceptional. What do they have in common? They all take a walk down a long and twisted path, one cold-hearted and 'expedient' decision at a time, shifting responsibility by deflecting the choice for their actions on their leaders. There is always some crackpot theory. some law of nature, from scientists or economists to support it. What else could they do? It is always difficult, but necessary. They cope with their actions by making their victims the other, objectified, different, marginalized. And what they marginalize they cannot see. What they cannot see, by choice, is easily ignored. And so they destroy and they kill, first by neglect and then by more efficient and decisive actions. They walk slowly, but almost determinedly, into an abyss of their own creation. But they all seem to have one thing in common. First they come for the old, the weak, the disabled, and the different, in a widening circle of scapegoats for their plunder. "There is one beautiful sight in the East End, and only one, and it is the children dancing in the street when the organ-grinder goes his round. It is fascinating to watch them, the new-born, the next generation, swaying and stepping, with pretty little mimicries and graceful inventions all their own, with muscles that move swiftly and easily, and bodies that leap airily, weaving rhythms never taught in dancing school. I have talked with these children, here, there, and everywhere, and they struck me as being bright as other children, and in many ways even brighter. They have most active little imaginations. Their capacity for projecting themselves into the realm of romance and fantasy is remarkable. A joyous life is romping in their blood. They delight in music, and motion, and colour, and very often they betray a startling beauty of face and form under their filth and rags. But there is a Pied Piper of London Town who steals them all away. They disappear. One never sees them again, or anything that suggests them. You may look for them in vain amongst the generation of grown-ups. Here you will find stunted forms, ugly faces, and blunt and stolid minds. Grace, beauty, imagination, all the resiliency of mind and muscle, are gone. Sometimes, however, you may see a woman, not necessarily old, but twisted and deformed out of all womanhood, bloated and drunken, lift her draggled skirts and execute a few grotesque and lumbering steps upon the pavement. It is a hint that she was once one of those children who danced to the organ-grinder. Those grotesque and lumbering steps are all that is left of the promise of childhood. In the befogged recesses of her brain has arisen a fleeting memory that she was once a girl. The crowd closes in. Little girls are dancing beside her, about her, with all the pretty graces she dimly recollects, but can no more than parody with her body. Then she pants for breath, exhausted, and stumbles out through the circle. But the little girls dance on. The children of the Ghetto possess all the qualities which make for noble manhood and womanhood; but the Ghetto itself, like an infuriated tigress turning on its young, turns upon and destroys all these qualities, blots out the light and laughter, and moulds those it does not kill into sodden and forlorn creatures, uncouth, degraded, and wretched below the beasts of the field. "Any one who is acquainted with the state of the population of all great industrial centres, whether in this or other countries, is aware that amidst a large and increasing body of that population there reigns supreme . . . that condition which the French call la misere, a word for which I do not think there is any exact English equivalent. 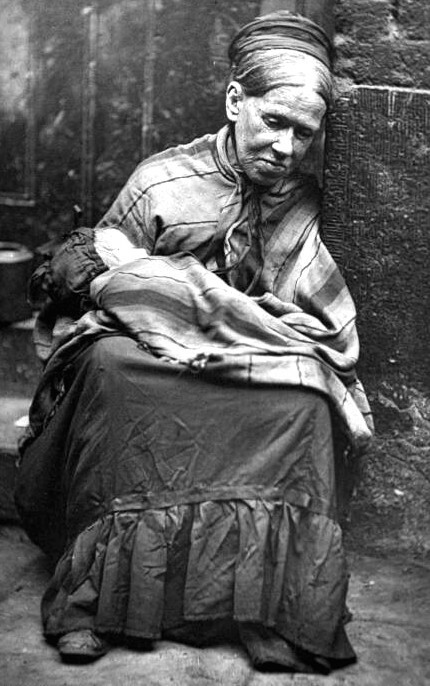 It is a condition in which the food, warmth, and clothing which are necessary for the mere maintenance of the functions of the body in their normal state cannot be obtained; in which men, women, and children are forced to crowd into dens wherein decency is abolished, and the most ordinary conditions of healthful existence are impossible of attainment; in which the pleasures within reach are reduced to brutality and drunkenness; in which the pains accumulate at compound interest in the shape of starvation, disease, stunted development, and moral degradation; in which the prospect of even steady and honest industry is a life of unsuccessful battling with hunger, rounded by a pauper's grave." In such conditions, the outlook for children is hopeless. They die like flies, and those that survive, survive because they possess excessive vitality and a capacity of adaptation to the degradation with which they are surrounded. They have no home life. In the dens and lairs in which they live they are exposed to all that is obscene and indecent. And as their minds are made rotten, so are their bodies made rotten by bad sanitation, overcrowding, and underfeeding. When a father and mother live with three or four children in a room where the children take turn about in sitting up to drive the rats away from the sleepers, when those children never have enough to eat and are preyed upon and made miserable and weak by swarming vermin, the sort of men and women the survivors will make can readily be imagined."